7/18/15 UPDATE: Now that Donald Trump has maligned Senator John McCain as a phony war hero who got himself captured in Vietnam, below you’ll find a reminder--which TSG published the last time the Republican claimed to be running for president--how Trump avoided military service. 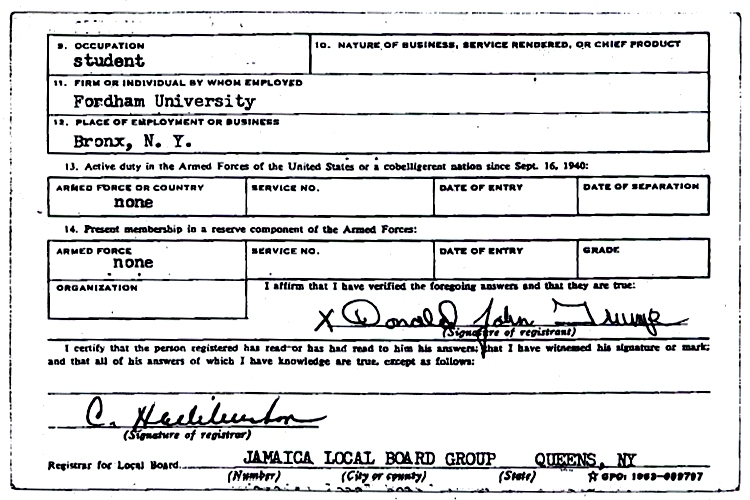 The son of a wealthy real estate developer, Trump received four student deferments that were followed by a 1968 medical deferment that came a few months after he graduated from the University of Pennsylvania. After denigrating McCain during remarks today at the Family Leadership Summit in Ames, Iowa, Trump faced reporters’s questions about his lack of service. 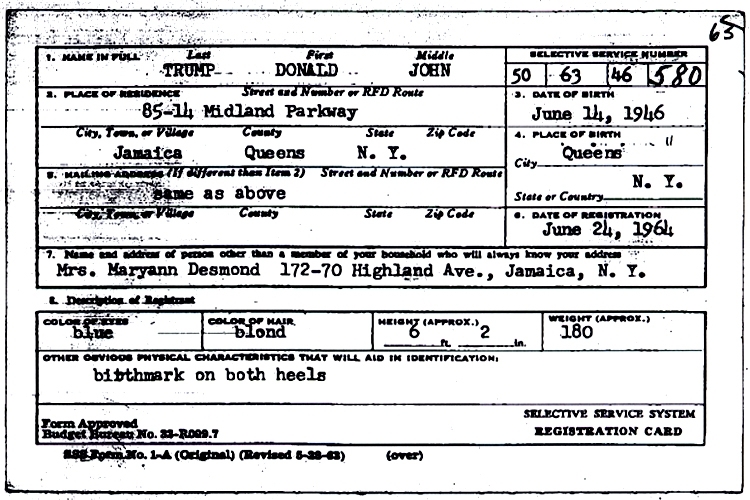 Asked about the last of his five deferments, Trump said that his disqualifying medical condition was a bone spur in one of his feet (he could not remember which one). It is unknown on which golf course the injury was sustained. 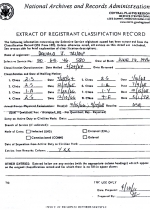 However, Selective Service records reveal that Trump, the fortunate son of a multimillionaire real estate baron, took repeated steps to avoid serving in Vietnam. Submitted by rocketman on Fri, 2011-04-29 16:43.
um, no. 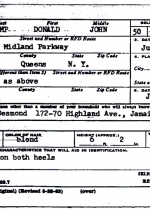 the news is Ovomit released his birth certificate. finally. even the mighty Hillary couldn't get him to do it. Trump did, it was posted here, and it was the first time it had seen the light of day. thats the news. Submitted by rocketman on Fri, 2011-04-29 16:45. Submitted by riverstyx on Fri, 2011-04-29 01:14. Ah, the very definition of "Chickenhawk" rears its ugly head once again. This should be a fun read. Submitted by Drewster2011 on Thu, 2011-04-28 23:01. Your last sentence proves my point, Astronoob. The media attacks everyone EXCEPT Obama... you know... because nothing is his fault and, if you feel otherwise, you're at the very least non-progressive, and probably a racist. Submitted by astronoob on Thu, 2011-04-28 22:56. There's no double standard here. This is clearly the result of the squeaky wheel getting the grease. Trump has been pushing for more and more exposure of Obama and as such is getting more scrutiny himself the more he opens his mouth. Submitted by Drewster2011 on Thu, 2011-04-28 22:47. The media has never put Obama -- before or after he was elected -- through the same scrutiny they put everyone else through. Such a biased double-standard. The media has been "looking the other way" for so long now, they're going to need neck surgery when Obama's no longer in office. Submitted by shag11 on Thu, 2011-04-28 20:08. 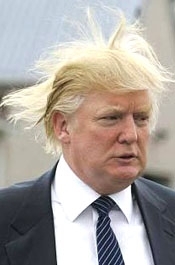 Well, let's see how The Donald will hold-up to media scrutiny, when they do what they do. Which is crawl up your patutti, once ya get out there. Submitted by ronindave on Thu, 2011-04-28 18:27. I don't care if he didn't go to Vietnam. However I found it amusing that Republicans made a big deal about it with Clinton only to later vote in a President and Vice President who both avoided Vietnam in contrast to their opponent who did go! Submitted by MagnumXL on Fri, 2011-04-29 10:55. And the vile GOPigs smeared Kerry's service. Submitted by labazro on Thu, 2011-04-28 18:18. The real question is, are we really thinking of Trump as a candidate? Isn't he just a side show freak candidate, like the comic sent out before the real acts show up? Please tell me he's not a real candidate. After watching the fiasco of pretending Palin was a real candidate, I can't take it again. Please Republicans, find a fiscally responsible candidate who is eager to cross party lines to find solutions to our problems! A fiscally responsible, very boring moderate might be able to save our country. Forget the tea party rabblerousers! Submitted by Working Liberal on Fri, 2011-04-29 09:13. What happened to Rockefella Rupublicans? Why is the political spectrum so far to the right? The worst part is Obama is too moderate for me but the rebublicas still like to shout from the rooftops that he is some crazy liberal lunatic. I see almost no change since Bush was in office. Submitted by labazro on Fri, 2011-04-29 11:15. EXACTLY! It's such a joke to call him a liberal or a socialist. He's completely moderate. I won't say he is like Bush, because Bush had a completely hands off domestic policy--"let the house burn, boys, it'll put itself out in the natural course of things." Like what Obama does or not(I often don't), at least he does something! GW was collecting checking for doing nothing while the country was going into decline. Anyway, I could go for fiscally responsible, boring, moderate republican. And I wish Trump would just go away. Submitted by Working Liberal on Fri, 2011-04-29 14:12. I often don't like Obama's policies either. At this point I find myself a Liberal because outspoken moderates are nowhere to be found and in my opinion this country doesn't need too many fiscally conservative economic policies. We are in a recession and I believe in keynesian economics. Submitted by Working Liberal on Thu, 2011-04-28 18:03. I'm not a fan of Donald but I won't hate on anyone who got out of fighting that war. Poor or rich, it was a horrible place to be (No, I was not there). Submitted by mmcs7191 on Fri, 2011-04-29 17:46. As a die hard liberal and a twenty year Navy vet 71-91, the point is not whether he went to a horrible war, but that he lies about why he did not serve at that time. I joined during Vietnam but didn't serve in country, did that in the First Gulf War. I don't mind if someone had a deferment to not serve, but if you lie about it and then start talking like you are a street punk but couldn't fight your way out of your own hair, you have shown yourself to be what Emerson referred to as a "sunshine patriot". Donald Trump is nothing more then a cowardly bully. Submitted by Mo Ma' on Thu, 2011-04-28 18:00. His millionaire father paid off the examinating crook doctor and others at the Selective Service office and his son didn't have to serve in the military, but now he wants to be Commander and Chief???? What a piece of sissy-fied crap in a bad suit.....this guy couldn't carry my jock strap!!! Enough of this carnival barker clown in a bad hair piece-TSG should stop reporting about this sissy draft dodger......money is not a measure of good character!!! Submitted by chefb5759 on Thu, 2011-04-28 17:34. Submitted by riverstyx on Fri, 2011-04-29 01:29. Clinton didn't break a single law. He received a student deferment then took advantage of that. And he was never officially drafted, either, due to his high-number that was unlikely to be called on. Submitted by snookie_sg on Fri, 2011-04-29 02:42. Funny how the sons of rich white men ended up with high draft numbers. Guess they're just lucky huh? Submitted by Swampfox26 on Fri, 2011-04-29 09:33. Sorry, Snooki - The draft number selection was a random process held each year. They pulled a birthday out of a bin and assigned it a number (1-365). If your birthday was the first one pulled, you were the Lucky #1. The last one pulled got the really lucky #365. Since there were both rich and poor men with the same birthday, the rich ones could not "buy" a higher number. Submitted by acarsaid on Fri, 2011-04-29 15:09. Submitted by notcklein on Fri, 2011-04-29 13:30. Sorry, Swampfox26 -- You're comment is incorrect. The United States had a draft in place dating back to World War II. In the 60's, both before and at the height of the Vietnam War, and during the period of time when Trump was in college, millions of men age 18 and older were drafted into the military. 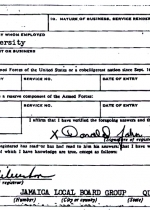 Trump managed to use student and medical deferments to avoid service throughout this period. Draft card burnings and other forms of draft protest were used as part of the larger effort to protest and end US involvement in the Vietnam War. The draft, as those of us who grew up in that era knew it, was forever changed in 1969 when Nixon replaced it with the draft lottery, which then was replaced in the 70's with the all-volunteer Army. Trump's avoidance of the draft during the 60's had nothing to do with the luck of a lottery number. 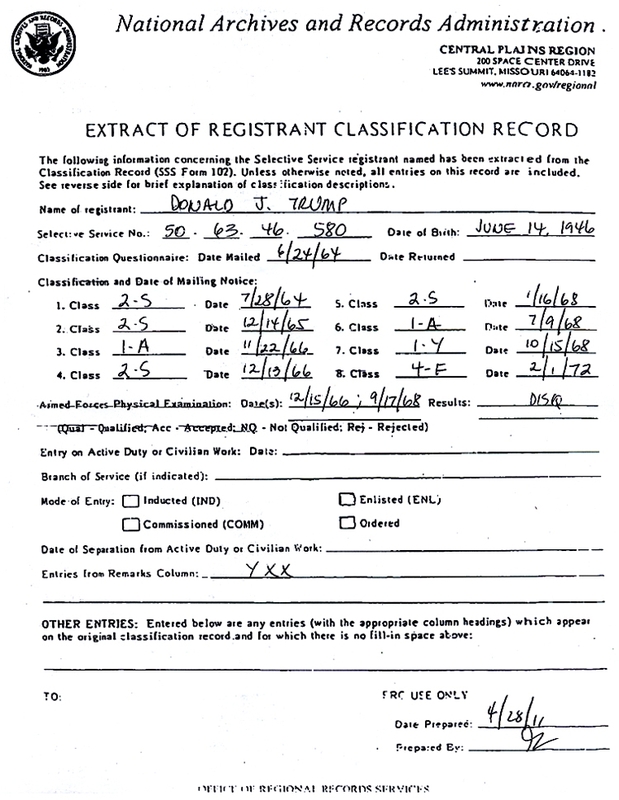 The thing with Trump now is that, as with his claims about Obama's birth certificate, he is just flat out lying about his draft record and he knows it. He used every device at his disposal to keep from being drafted, as did so many others. [I enlisted and went to Vietnam myself]. But he must think we're all too stupid to see it, or that we weren't going to find out. Submitted by notcklein on Fri, 2011-04-29 13:31. Submitted by worst-case scenario on Fri, 2011-04-29 11:36. The rich men paid doctors to get their kids deferments. I know, I was working in a pharmacy at the time in a very high-wealth area, and the guys would come in all the time, talking about how they'd managed to "get their kids out of there." We knew the local doctor that would write the recommendations for medical deferments, as well. The draft was equally fair to everyone who didn't have the money or connections to buy their way out. Submitted by frogdance on Thu, 2011-04-28 23:49. Right and legal? What kind of BS is THAT?? ?